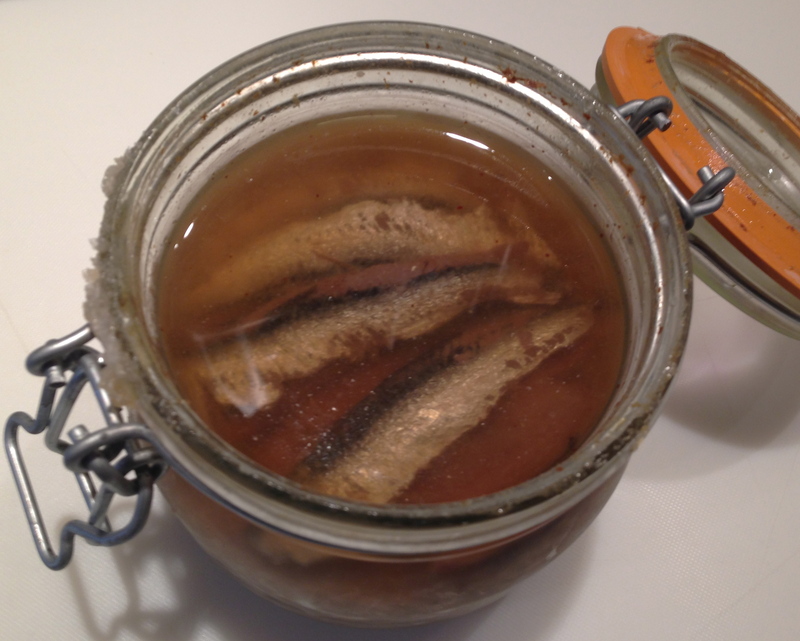 Salted anchovies have been a recent joy in my winter salad dressings. Chopped or mashed – depending on how soft they are – and mixed simply with good olive oil and white wine vinegar (or more robustly with a little dijon mustard, and red wine or walnut vinegar), this is a regal dressing for any crisp leaf like winter chicory, romaine or little gem lettuce. You could use canned anchovies in oil, though they are far less subtle than the ones preserved by salting, so you’d need to use a far smaller amount. 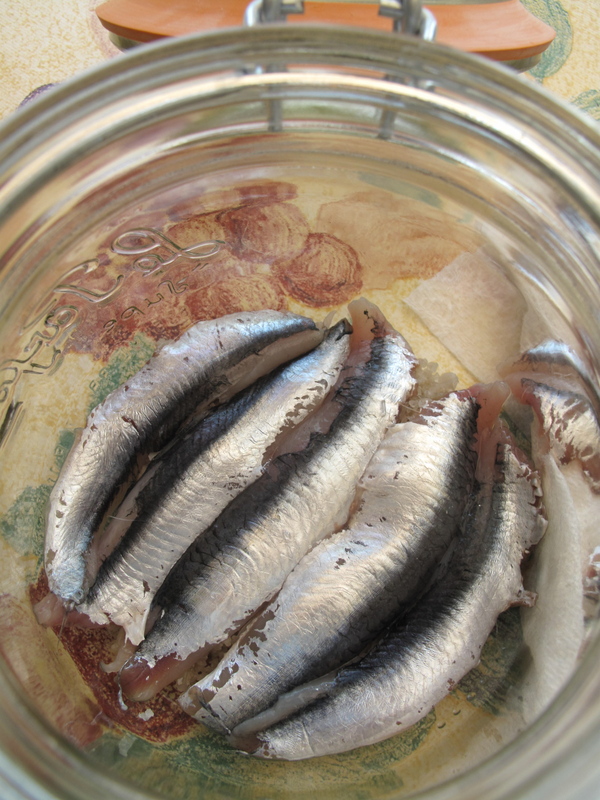 In an end of year clear-out I was lucky enough to find in my cupboard a jar of anchovies I salted myself while staying at a friend’s house in the Provencal hills. 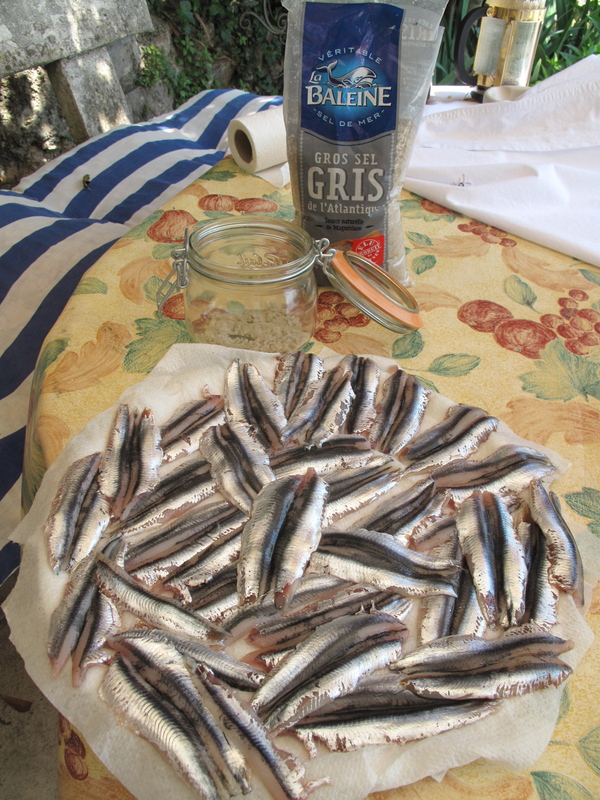 A happy afternoon buying sparkling fresh anchovies at the market in nearby Vence followed by a few hours in the shade cleaning then layering them with salt in heavy, tightly sealable le Parfait jars, and there they were: an affordable luxury to last me though the winter – or even two winters, given my store-cupboard management! There’s no need for a recipe. 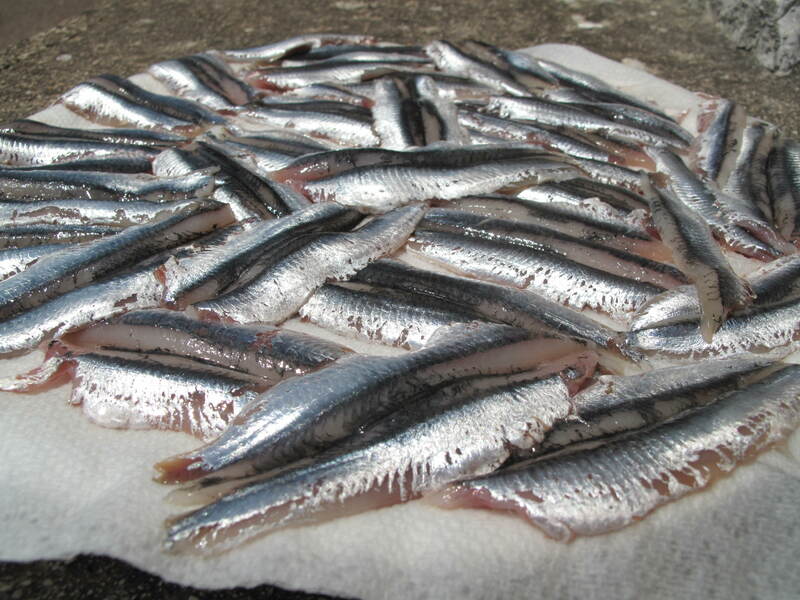 You’ll simply need a big bag of sea salt (I used gris de sel as that was what was available in the local supermarket, but whichever rough salt is least expensive will work); however many of the freshest anchovies you can obtain; a sharp knife; and enough jars to hold them once gutted and filleted. 1. 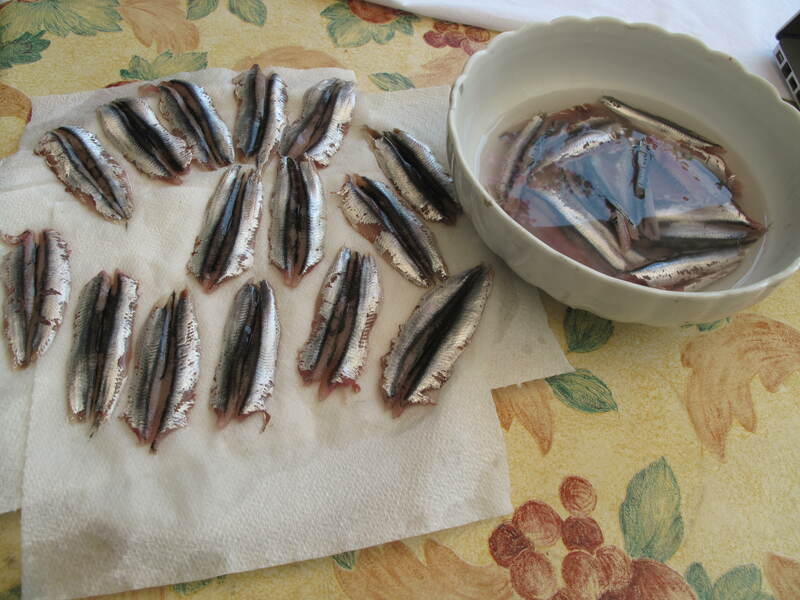 Fillet and clean the anchovies, discarding the bones, heads, tails and guts. 2. Wipe them clean, using a little water to rinse if necessary, and set aside to dry off. 3. 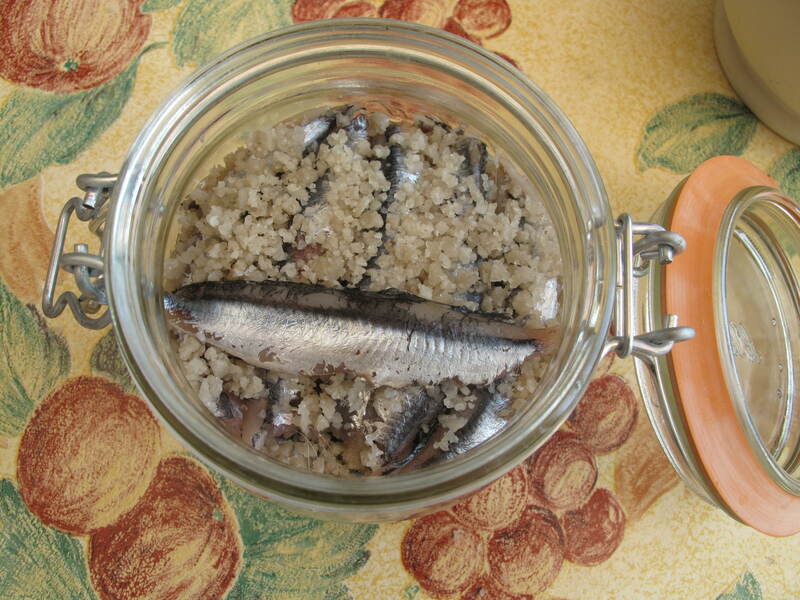 Sprinkle a thin layer of salt in the bottom of the jar, and lay a neat layer of anchovy fillets on top. Sprinkle another layer of salt followed by another layer of anchovies laid cross-wise to the previous layer, continuing until the jar is full and finishing with a thin layer of salt. 4. Tap the jar to level everything off, seal, and store in a dark cool cupboard. Keep for at least 2-3 months before use and store in the refrigerator after opening.